The issue opens in Vanity City, where Piper, a small-time super-villain, engages in a clandestine meeting. Worried about his daughter, Piper is forced to meet with her kidnappers and Synth, a former member of a super-hero team known as the Vat-Men. Synth's mind is in constant flux, and it is Synth that is “guarding” Piper' daughter.<br />Meanwhile, the new hero, Aztek, has arrived in Vanity City. His mission is to get the lay of the land, and to create a secret identity for himself. However, he has no idea how to do that. 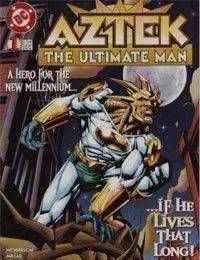 With no social security number and no money, Aztek has a hard time finding a place to live. He goes to a local bank, trying to figure out a way to get money, when the bank I robbed by Piper and his army of small self-functioning pipes.